« Pork Sticker Festival – Millennium – Budapest – 2016. 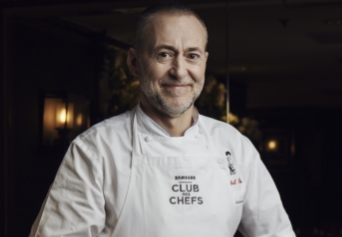 Samsung Electronics announced that the Michelin-starred, UK’s most admired chef, Michel Roux Jr. is to become the eighth member of its esteemed Club des Chefs. “Launched in June 2013, the Samsung Club des Chefs invites visionary chefs from around the world to contribute their unique insight and fresh ideas for creating next generation kitchen products. This spring, the Club des Chefs will be launching an app for the newly announced Family Hub connected fridge, featuring recipes, cooking advice and hands-on appliance demos from the chefs themselves. Michel Roux Jr. of Le Gavroche and Roux is also known in the UK as a popular TV personality, appearing as a judge and presenter on the BBC’s primetime programme, Masterchef. His entry into the Samsung Club des Chefs sees him join fellow food visionaries including Elena Arzak, fourth generation owner of the three Michelin-star Arzak; Daniel Boulud, one of the most revered French chefs in New York; and French three-star Michelin chef, Michel Troisgros. “I think the premise of the Samsung Club des Chefs developing technology to help people increasingly experiment in their own kitchen, is really exciting. The Family Hub is a wonderful example of bringing people together in the heart of the home – in the kitchen. I’m delighted to be joining my peers and friends to share our expertise and passion, partnered with Samsung’s innovation, to help people master their own cooking at home.” said Michel Roux Jr.